Healthcare has been a somewhat paradoxical industry in that it has made tremendous clinical strides with rapid advancements of treatments, medications, and diagnostics. These advancements have required significant investments and risk-taking by the companies and clinicians involved. From a management perspective, however, healthcare has been typified by risk-averse practices focused on avoiding errors rather than making advancements. This risk aversion has been enabled by the relatively mature and stable "business of healthcare". This stability is being upended by significant changes which are creating tremendous uncertainty. 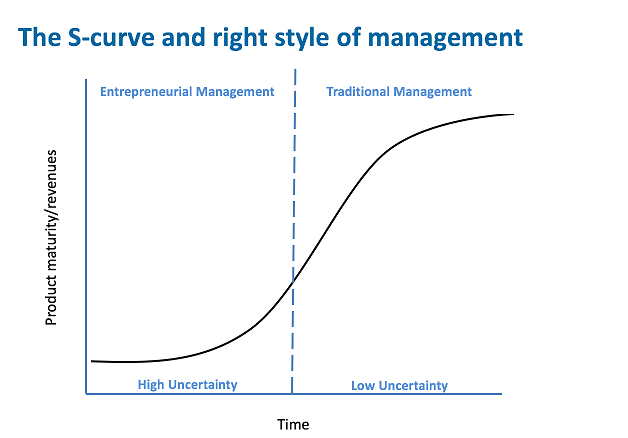 There are two key types of uncertainty faced by most industries – technical and demand. Healthcare has had a relatively certain level of demand for decades while there has been increasing, but still relatively moderate, levels of technical uncertainty compared to other industries. Increasing consumer expectations are going to dramatically increase the uncertainty of demand in the coming years – new sites of care are opening in various settings (e.g. drug stores, fitness centers, and online) with a push to meet consumer preferences for convenience and 24x7 access for non-urgent needs. The Triple Aim is going to fundamentally transform preventive and ambulatory services which will in turn significantly decrease inpatient volumes (admittedly, this decrease will be somewhat offset as the baby boomers enter the age of high care utilization). But how and at what pace remain to be seen as most health systems carefully transition to value-based care. Healthcare leaders who have succeeded in the previous environment have done so by being good planners who get things done on time and on budget – they have been careful and practical and tried to keep as many stakeholders happy as possible. With the significant change underway in healthcare and with high demand uncertainty, being careful and avoiding mistakes is now riskier than not experimenting and taking chances. As Furr and Dyer advocate in their book The Innovator's Method*, leaders will need to be "chief experimenters". Instead of asking "What's your answer and the analysis behind it? ", they will need to ask – "What's the fastest way to get an experiment to test the idea?" Data and objective analysis will more often drive decision-making. While there will always be a need for traditional management to manage the "hotel" parts of the healthcare business that are relatively stable, a new crop of innovative leaders will be needed to build parts of the organization that will become the new growth engines in a value-based healthcare world. This need for innovation will extend beyond the clinical aspects of healthcare to also include supply chain, revenue cycle, HR, facility planning, and design amongst others. They will need innovative approaches to support the rapidly changing clinical side of the business. These innovators will need to help develop a vision, get stakeholders onboard, research and identify customer needs and new ways of working, prototyping, failing, learning, and iteratively building new services and business models suited to the changing environment. The right answers will address more than just the functional needs of patients, they will also address their social and emotional needs. Some of the skills and knowledge needed for success may not currently exist in provider organizations – they will need to pull from payors, public sector, high tech, big pharma, start-ups, and other sectors. Identifying the necessary traits, finding and recruiting the right people, and orienting them to the provider world will be a challenge. In order to be successful in the value-based world, these leaders will need to understand the various sources of data and figure out ways to integrate them for operational and analytic purposes so they can be appropriately leveraged. The data is currently in siloes and these innovators will need to fully understand the different pieces and how best to link them together. Lastly, these new innovative leaders must understand the power shift from physicians as a hospital's main customer to the patient and their family as the primary customer. This requires a consumer-minded approach that focuses on the whole patient experience – within the hospital and beyond. Building and maintaining an engaged relationship with patients and their families requires new tools and technologies that are minimally-used by provider organizations today. Providers are early in the journey to become more patient-centric in order to better meet the demands of consumerization and value-based care. Many are taking on additional risk and changing their strategy and processes. But this also necessitates new management styles which recognize the need for innovation and more experimentation. This is no easy task and it will take time to fully embrace and evolve. But, with acceptance and commitment, the new management styles will lead to a more innovative industry that can meet the ambitions of the Triple Aim. * Furr, Nathan and Dyer, Jeff. The Innovator's Method. Harvard Business Review Press, 2014. www.theinnovatorsmethod.com.